Royal Berkey Water Filter Giveaway! | Best Countertop Water Filter? The Royal Berkey Water Filter provides a simple, easy way to remove *fluoride and so many other dangerous chemical from your drinking water. In the past year or so, I’ve heard a lot of good things about the it from other bloggers who I respect. I love the fact that it would filter more than enough water for daily use for my family of eight. I love the fact that it does not use electricity. There is no need to hire someone to install it--it simply sits on the counter. Is *Fluoride Really That Dangerous? In a word--yes. And now the fact that it is not safe for humans has been recognized by the world's oldest and most prestigious medical journal, The Lancet. Dr. Philippe Grandjean of Harvard School of Public Health, and Dr. Philip Landrigan, of Icahn School of Medicine, wrote the article. According to their research, *fluoride may cause autism, attention-deficit hyperactivity disorder, dyslexia, and other cognitive impairments. You can read the summary of Neurobehavioural effects of developmental toxicity on The Lancet’s website. 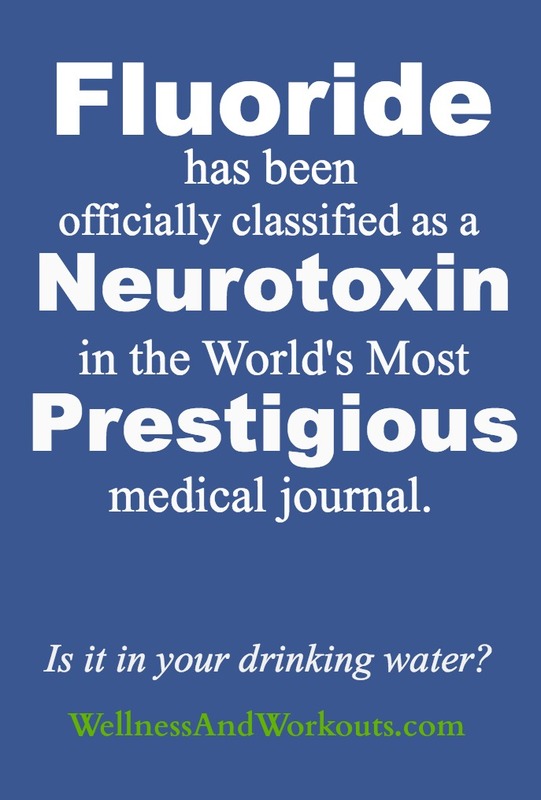 Does Your Drinking Water Contain *Fluoride? If you live in the United States, and your tap water is provided by a local city or utility company, it is highly likely that your water is fluoridated. Not good. But there is a simple, economical solution. The Royal Berkey Water Filter. What is a Royal Berkey Water Filter? It is a water filter for your home, that sits on your counter top. Unlike many water filters on the market for home use, this water filter removes most unwanted chemicals, foul tastes, odors and heavy metals without removing healthy minerals that your body needs. Does not require electricity, can run without power! As long as there is gravity, it can filter and turn any kind of water into clean, delicious drinking water. No handyman or plumber needed to install--it just sits on your counter! 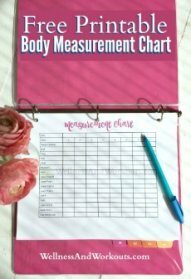 Removes most unwanted chemicals, foul tastes, odors and heavy metals without removing healthy minerals that your body needs. 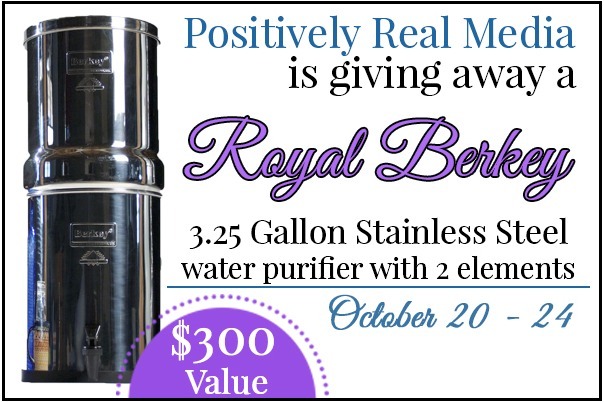 Enter to Win Your Own Royal Berkey Water Filter! My guess is that you are blessed with access to clean running water. We don't really worry about getting parasites or other waterborne diseases when we turn on our tap. But while we are blessed with clean water coming through indoor plumbing, are you aware of some of the environmental contaminants that are frequently found in that water? Traces of heavy metals like mercury and aluminum, pesticide residues, and volatile organic compounds can be found in our drinking water! This is why the bloggers of Positively Real Media are so excited to be teaming up to bring to you a Royal Berky 3.25 Gallon Stainless Steel Water Purifier giveaway sponsored by United Environmental Solutions! Berkey water purifiers are truly unique water purifying systems. According to UES, they are able to remove red food coloring from water while still allowing beneficial minerals to remain! As free-standing units that put the power of gravity to use, the Berkey systems don't use any electricity. This makes them excellent systems to have on hand while camping or during power outages. While whole house filtration systems can be fantastic solutions to the problem of residual water contamination, they are simply out of the budget for most families. However, a Berkey system is a fraction of the cost and can filter 4 gallons of water per hour, making it a great fit for families! If you want to ensure that your family's drinking and cooking water is as clean and pure as it can be, a Berkey may be just what you need! Win A 3.25 Gallon Royal Berkey! 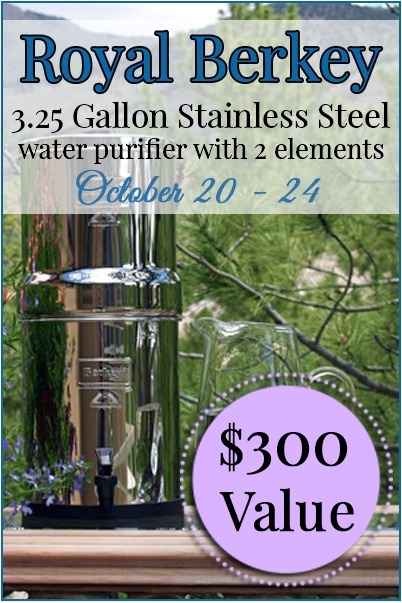 The bloggers of Positively Real Media, a network of naturally-minded Christian bloggers, are thrilled to be able to offer one of our readers a 3.25 Gallon Royal Berkey Stainless Steel Water Purifier, valued at $300! Many thanks to United Environmental Solutions﻿﻿ for providing this fanatic prize to one blessed reader. Just use the Rafflecopter form below to get your entries in! * Since I originally wrote this article, I have learned that it may be necessary to purchase an additional fluoride filter for the Royal Berkey Water Filter, but they are available for purchase. Please check with United Environmental Solutions for details and pricing. Thanks, and sorry if this has caused you any inconvenience.